Let me begin by saying that we were a little intimidated by Managua. 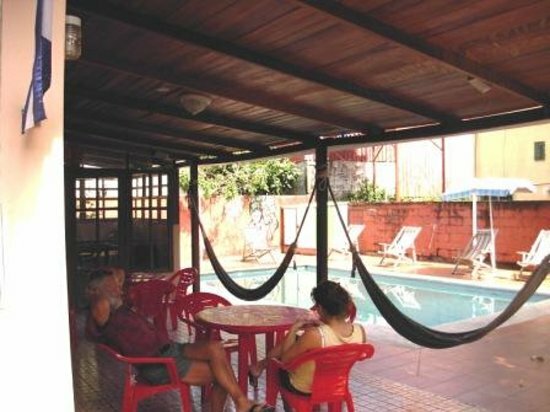 We had heard a lot about what not to do there and were feeling less than encouraged by guidebook quotes like, “tourists tend to land in Managua and leave. Quickly.” We’d also heard a lot about how unsafe and discombobulated the public transportation was (everything from it being impossible to figure out to the great likelihood of being robbed at knifepoint while on it). Our hostel had a list of warnings on the wall, right next to a map that clearly outlined “safe” and “unsafe” neighborhoods. However, we’re not the kind of people to sit in a hostel all day because we’re afraid to venture outside. We didn’t do anything really extraordinary, but we did end up sharing what is a pretty common pastime with a certain class of people in Managua. Stop. I hear you judging (I’d be judging). Before you jump to the conclusion that I’m a mallrat or start heckling me for going to a mall when I’m in a freaking foreign country and could be doing ANYTHING else, let me explain. I hate malls with a burning fire-and-brimstones passion. If I go to hell when I die, hell will be a shopping mall around Christmas. Commercialism and chaos. I did have a brief mallrat phase when I was about 12 (I lived in South Jersey – there really isn’t much else to do), but I got over that fast. So, obviously I was a little annoyed to be in a shopping mall in a foreign country, even though our options were limited. However, as I looked around and slowly noticed that we were the only tourists there, I realized that we were, in fact, sharing an experience with the residents of Managua. I decided to enjoy it. Having spent little time inside malls since before India, I was overwhelmed and occasionally found myself casting my gaze around for a nice quiet space with minimal sensory stimulation. However, I persevered and we wandered aimlessly around for a bit, before deciding the ultimate experience would be to see a movie in Spanish (well, subtitled in Spanish). Sombros Tenebrosas (or, Dark Shadows) was the movie of choice. Ticket buying was in and of itself an experience: apparently going to the movies on a Saturday night is THE thing to do in Managua. Everyone was seeing either Ice Age 4 or Madagascar 3. Tickets were less than four dollars. That alone made the entire experience worth it. 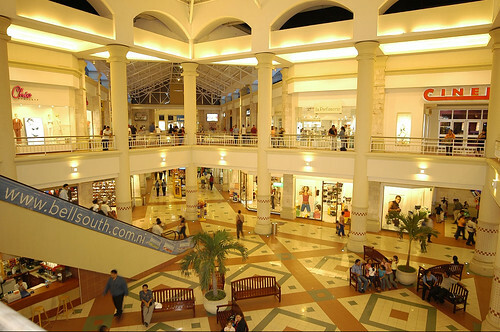 Since we had about an hour or so of extra time before the movie, we decided to complete our Nicaraguan mall-going adventure by venturing down to the food court to see what we could find for dinner. It. Was. Insanity. Absolutely packed. I briefly contemplated the fact that if I was doing this in America, I would be seriously cranky. But, it was Nicaragua, so I rolled with it. The sheer number of people packed into the space was overwhelming. There were also a concerning number of fried chicken places. In a feeble attempt to be somewhat healthy, we ended up at a place called GoGreen! that did paninis, salads, etc. I got a quesadilla that sounded good on paper, but in practice was so bad I gave up after half. Courtney’s panini was likewise. I decided it would be a better choice for me to have gelato instead of eating any more nasty, uncooked, limp, cold quesadilla, so I bravely navigated my way across the food court to the gelato place, where I stood in line behind two teenagers who were clearly on a date for what seemed like an eternity. My length of time waiting on line was increased when two people casually stepped in front of me. There’s the very real possibility that I was allowing for too much personal space between myself and the two teens. As I learned, the way this gelato place worked was that you paid first, then ordered your ice cream. I successfully managed the first piece, then waited for another period of time to place my order. Clearly, I wanted gelato pretty badly. I learned quickly that I was not allowed to order two flavors together and that the flavor I wanted more was a “different price.” Okay. So, as I was debating my options, the guy scooping the ice cream said (in Spanish), “Reese’s! You’ll like it, here, try!” and pushed a sample into my hand. Never one to say no to free ice cream samples, I tried it. I felt bad ordering hazelnut instead because he clearly wanted me to like the Reese’s. However, as he handed me the hazelnut, he said, “disfruta!” This means “enjoy!” except he said it quickly and I wasn’t fully paying attention (ice cream can be quite the distraction), so I said, “que?” He repeated it in English and said, “you can enjoy!” It was the highlight of my day. I promised I would and returned through the sea of tables, chairs, and people to Courtney and Sara, who’d been wondering what on earth had happened to me. We learned the hard way that the staff will not allow you into your theatre until the exact time printed on your ticket. Our movie started at 4:10 and we were not allowed past the ticket stand until 4:10. Also, our seats were assigned, which was actually kind of awesome. We got to choose the seats at the ticket booth. America should pick up this habit, because arriving late to a movie and getting crappy seats is never fun. After the movie, we stopped by the supermarket to get some stuff to nosh on for dinner. For some reason, I wanted tortilla more than anything else, so I bought a small pack of those (mistake: they were terrible). We also found Nica chocolate (previously mentioned in the “Coffee, Volcano, & Where Almonds Come From” post on the former Blogger-hosted blog.). I bought a bar of the 75% cacao chocolate, which was so rich that it took me two days to get through half the bar. It was so gloriously wonderful though. I’m devastated that it’s gone. Leaving the store (foreign grocery stores are always fascinating, by the way), we realized it had gotten dark. As we’d been repeatedly warned against wandering around after dark in Managua, this was not ideal. Fortunately, the walk was not long and we made it back safely, where we met Roberto, a 19-year-old native who worked in the hostel. He was hysterical and I’ll be talking more about him in the next post. We decided to hang out on the patio behind the hostel, where I planned to do some writing in my journal. However, we met John, an older American, and Malcolm, a 20-something from Toronto, instead. We chatted a lot about traveling and where everyone had been. We also had a nice, healthy conversation about politics, which is always interesting, if one-sided. I meet very few travellers who tend to be more conservative, which I’m inclined to believe is because traveling opens your mind to the point where it’s hard to accept certain policies or conservative belief systems. (Obviously, I’m speaking in generalizations here and as we all know, there are exceptions to every rule) Regardless, conversations and nights like that are the reason I really enjoy the hostel lifestyle. The people are always interesting and everyone has fantastic travel stories. Malcolm mentioned that he’d been in San Juan for a night and had stayed at the Naked Tiger hostel. His review of the place made us exceptionally glad that we’d opted out. Apparently, although the location was beautiful, the owners weren’t very hospitable, the other visitors acted as though they were above everyone, the nights were madness, and therefore, it was predictably weird during the day. As we sat and chatted, there was a bat that repeatedly swooped low over the backyard pool, occasionally skimming the surface. It did it a few times before I realized it was drinking the water. Very cool. Tisk tisk tisk. When you figure out why I’m tisking you, we can chat.